Join the fun and support the community! The majority of our volunteer positions are on event day, June 4th (Saturday). Help us monitor obstacles (aka play in the mud), hydration stations, course marshals, and more. If you are unavailable on race day, we need help building and setting up the course from May 30th (Monday) – Friday (June 3rd), 2016. The set up is a great way to get your cross training in and support a community event and cause. We have positions for all ages and physical abilities. Hard as Nails Mud Obstacle Race (HAN), located in Westminster, CO (a 10 minute. 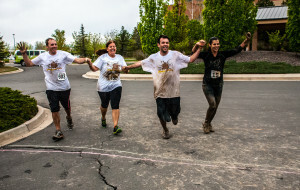 drive from Downtown Denver and 20 minute drive from Boulder), is a local Colorado 5k mud run for participants who want to challenge themselves while supporting their home community. With an adult 5k mud run and a separate 2.75k youth course, Hard As Nails is an obstacle mud race event for individuals of all ages. Hard As Nails will test your strength and fitness while guaranteeing lots of fun and a great outdoor experience! The adult course rivals any 5k mud run in the U.S. in terms of challenge, fun, and unique obstacles. The youth course is arguably the BEST youth obstacle mud run in the United States with different routes and difficulty levels designed for different age groups. With a variety of obstacles, the race will challenge you mentally and physically. From the “Dumpster Dive” to the “Mud Mixer,” you’re definitely going to get dirty and our 450 foot slip and slide is not to be missed. Adults, including beginners, go-getters, team players, and serious competitors, all are guaranteed to have a blast! The youth obstacle course is the perfect challenge for adventurous kids who love to play in the mud! This is one of those experiences that they will be talking about for years! It’s all about fun and there’s no better way to do it than to join us for the 2016 Hard as Nails Adventure Kids obstacle race. Our 3rd Annual Hard As Nails Obstacle Mud Race in Westminster is filling up! If you’ve been wanting to try an exciting and fun obstacle course now is the time to sign up! Come join us for one of the best obstacle races in the local Denver Metro and Boulder Area. The race supports two local Westminster non-profits and a portion of sponsorships funds goes back to the community.